Toca Tailor by Toca Boca AB lets your child be the tailor and create amazing clothing. Let your child’s imagination unfurl as they design their own line of clothing in Toca Tailor. Mix, match, and combine different patterns to create amazing and wonderful designs that you get to try on the different characters. There are four characters that you can choose to try on your wonderful creations with more than 20 different fabric designs to work with. You can also use the camera feature to capture images and create your own unique patterns giving you nearly limitless choices for your fabrics. Also included are accessories that you can use to add style to your already groovy characters and their fancy wardrobes. You can also use the camera to take pictures for use as backgrounds for your characters to model their fancy wares. 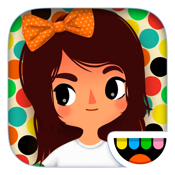 Toca Boca was last updated to Version 1.0.4 on March 13, 2013 and included some minor updates. There have been 80 ratings for this version with an average score of 4.5 stars out of five. Toca Boca has quite the series of apps going and this one is another shining star. I find these apps to be engaging and well thought out while nurturing a child’s imagination.